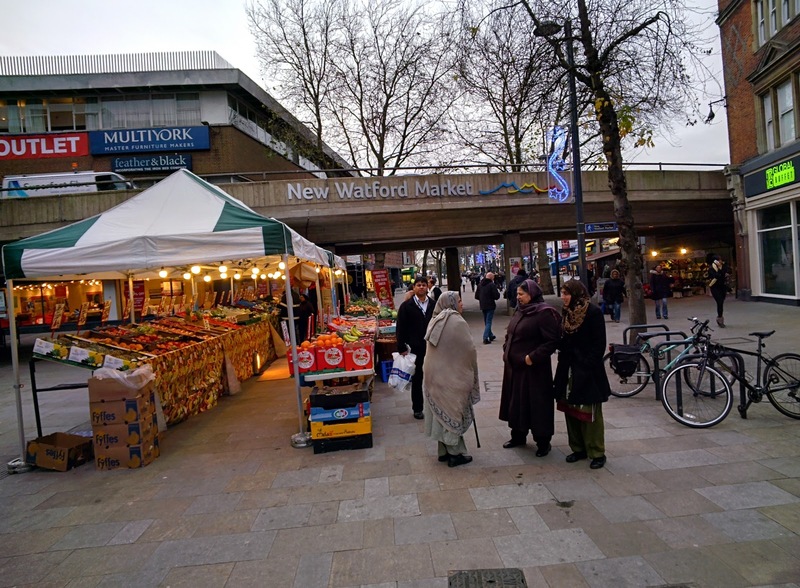 L4G South West Herts District: New Watford Market ~ what's really going on? This Saturday which was Small Business Saturday I spent about 4 hours around the Watford market from 10am through to 2pm. This was probably the coldest day so far this year on the New Market. The +Link4Growth Team meet up every Saturday morning at Ell's Kitchen to grab a bacon butty and a coffee or two. This week due to the cold weather we were driven inside the cafe rather than sitting in the outside seating area. Ray has installed some heaters inside the unit. We were reviewing the new A6 cards example shown which we will be using to start spreading the message wider afield about Link4Growth, community building and the #L4GBuyLocal initiative (please take a look at that blog too). So... I then had a chance to catch up with some of the market traders as well as do two more videos; Stan E-Cigarette company and Mina from the Shona Boutique. So after 8 weeks and now heading briskly into winter, how is the mood amongst the market traders in what should be their busiest period of the year. So far I have been down to the New Watford Market every weekend since it opened and there is definitely a different mood from the one in mid October for sure. There are certainly winners and losers on the new market. I am going to be as objective as possible in this report, as you know I am a massive fan of the market and along with all those in support of #L4GBuyLocal and #Watford we have to be honest. There is no point in being blindly positive in the face of what are quite basic shortcomings of the New Market and yet we must look to those who are responsible to get things sorted quickly or face a worsening of the situation which is fast reaching tipping point for a few of the stall holders. 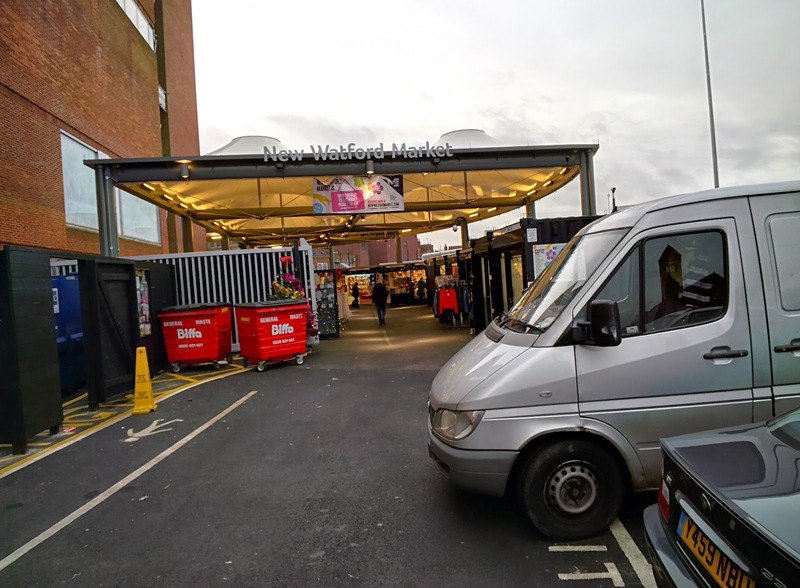 Unlike what is being intimated via the local press the Market Stall holders are not a bunch of moaning traders who have nothing better to do than bash the council or Town & Country Markets (new operator of Watford market). What the stall holders want is a decent place to operate their businesses with facilities that would be afforded anyone paying substantial rents and service fees (£6,000 per annum). Below is a list of items that need resolving, quite honestly it is unacceptable and the Council should be putting pressure on Town & Country Markets to hold a performance review sooner rather than later. They are quite obviously not meeting even basic 'service level' criteria. Ultimately the Council have outsourced the running of the market but they still have a responsibility and duty of care to ensure that their supplier is doing the job! One cleaning operative for the entire market with what appears to be little supervision or guidance. Last week photographic evidence was taken of a veritable mountain of rubbish piled against unit 25 (Shona Boutique). This contained fish heads, meat and food products and represented a health hazard, notwithstanding an open invitation for pest infestation. The severity of the wind lead to one of the commercial bins being blown against a van whose occupant managed to restrain the bin from on the ring road itself, narrowly averting an accident. The rubbish has now been removed, but this incident highlights a lack of proper waste management, something the Market is in urgent need of. From the day the market was opened there has been inadequate signage. There has been much talk of illuminated signage, projected images highlighting the market location... In fact lots of promises. What we have are a few light post signs, well above head height and not something you would notice in normal walking mode. Recently completed signs on the Bridge. These don't appear illuminated and really serve to give the impression that the market is actually in the high street itself not where it is tucked away round the corner. The very least that is required at the high street end is an arrow to indicate where the market is located and some illuminated signs. There appears to be some other signage in Clarendon road which is good and now in other places so we're making progress but still much more to do... And a missed opportunity as the Christmas period is now passing fast. Some stall holders are now having to resort to paying extra to have an additional high street presence as people are assuming the New Market are the few stalls in the actual High Street ignoring the actual market altogether! Speaking with Dan (Meanwhile Across Town Comics) at the other end of the market the Clarendon Road side there really needs to be a rethink. An inappropriate car park, bins, poor design and a barely noticeable welcome sign culminate in an extremely lack lustre presentation which does nothing to attract potential visitors from office workers in Clarendon Road. For the New Market to increase footfall, compete for lunchtime trade and be a viable alternate lunchtime destination to Intu this entrance must be rethought. Another 4 or 5 stalls could be sited at this end increasing the variety of merchandise on offer and some decorative wrought iron welcoming arch would present a much more acceptable gateway to our town Market. To be honest the same style Arch ought to be sited at the other entrance too! Just to add insult to injury the budget allocated to Christmas decorations for the market have provided 3 small Xmas trees with a few lights and an odd bauble. It looks like an after thought... especially when in one situation the power lead stretches across the main walkway! The trouble with the arrangement of appointing 'private operators' to run services such as the market is that every pound spent on the market is a pound less profit. The focus for Town & Country Markets is clearly... This is a good opportunity providing it yields a decent profit. That profit has nothing to do with the success of the traders, only in careful management of their costs. I'm not saying I have the answer (yet) but with the 'operator' not incentivised to help make this work and the council having washed their hands of it, you can see why the traders now feel the only people interested in their success is themselves. Marginalisation of the market, and poor performance in every aspect of attention to detail in getting the market operational, you could be thinking the powers that be want this to fail. "we're not going to wither and fade away, we'll not go quietly into the night and disappear... No... We're going to make this work! 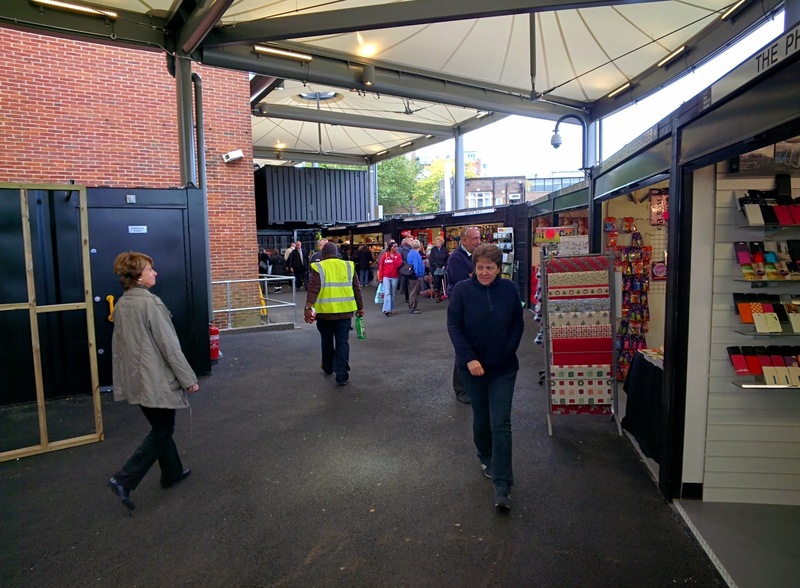 It's cold at times, it's windy too, it's outside and it's different, but we've invested a lot of time and money in the New Market and we're committed to making it work". All they would like to see is some effort from those around them and some shared passion for this important part of Watford. This ought to be a destination in Watford, people should see the decorative roof and signage and say 'we want to visit the Watford Market', there is still some way to go in getting even close to this. There is no doubt that some units will change hands over the coming 12 months. There is every probability that the range of products and services will change as the New Market settles down. The clientele have changed, the people that visited the old market via bus and collected for companionship and coffee once a week have now gone. The market must rebuilt almost from scratch and attract a younger audience and to do this it has to offer something not available elsewhere in Watford... Great food is a start, fresh vegetables, fruit, meat, fish and a Deli... Where is the Deli? But a secret ingredient is still missing to draw in more people, but I personally believe it will happen. In the same way that we must pull together to rebuild community in Watford, the New Market is a microcosm of this along with supporting all our local independent business owners who are working really hard in difficult trading times. We know that much more of the money we spend stays in the local community if we use local people. The market traders and all our local businesses need our support so please get behind the #L4GBuyLocalWatford campaign and let's ensure that our hard working local people stay in business and help Watford prosper in 2015.